Dental implants are compensation for one or several teeth. They are embeded in the jawbone. 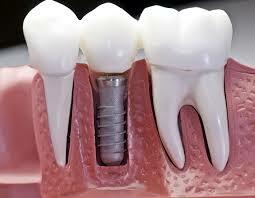 This process is followed by osseointegration, meaning integration of the jawbone and implants. The choice of material that is used for this procedure is narrowed to titanium because of its biocompatible nature that makes it acceptable for and compatible with the organism itself. 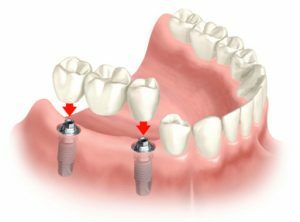 Dental implants bring back a normal comlexion of teeth by taking the exact place and form of the real teeth and are therefore the best option for regulating the teethless area when needed and when in a position to undertake such a prodecure. The lack of bone structure or bone quality are a contraindication for the placement of implant. After the process of osseointegration follows the setting of suprastructure above which comes the crown and bridgework. The first adult tooth that sprouts around the year od six is called a molar and it mostly sprouts firstly in the lower jaw. Preventive measures that are taken in these cases are dental sealants. This lessens the chances of caries development in the caries predilected areas and makes it possible for us to extend the time during which the teeth remain intact.